Want to know why your Council tax is going up again? 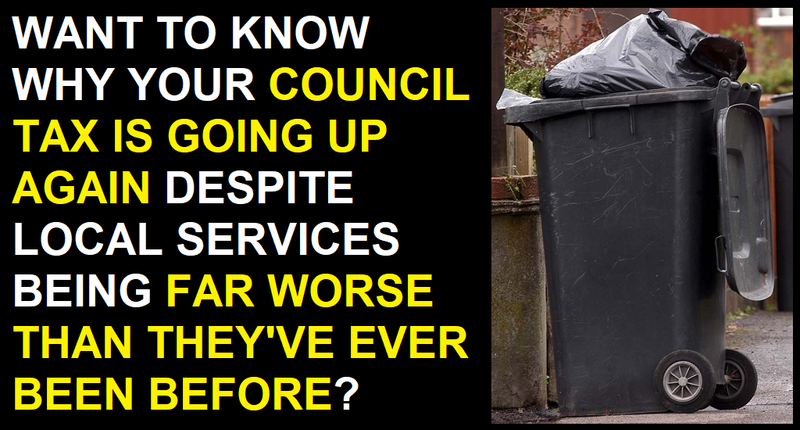 If you want to know why your Council Tax bill is going up, but the services your local council provide are worse than they've ever been before, I've got the answer for you. The reason that councils across the country are increasing Council Tax bills whilst simultaneously cutting what they actually spend on services is that the Tory government have slashed central government funding for local governments by 67% since 2010, and they're still slashing away at the Communities and Local Government budget now. This sustained Tory attack on local government funding means that councils have way less money to spend on maintaining local infrastructure and services. 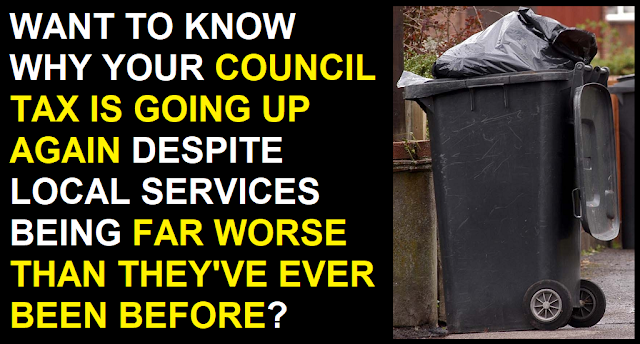 Local councils have far less to spend on waste services, so these ideologically driven Tory cuts are the reason that a huge number of councils have reduced bin collections to fortnightly. Local councils have far less to spend on local amenities like libraries, public toilets, leisure centres, and public spaces like parks and indoor markets, so these ideologically driven Tory cuts are the reason that they're being closed down and sold off to property developers. Local councils have far less to spend on running their planning departments, so these ideologically driven Tory cuts are the reason that simple planning applications are taking longer than ever to process. Local councils have far less to spend on highway maintenance, so these ideologically driven Tory cuts are the reason that our roads are deteriorating so badly. Local councils have far less to spend on youth services, so these ideologically driven Tory cuts are the reason that councils up and down the country have cut back on youth clubs andother programmes to keep young people occupied and out of trouble. Local councils have far less to spend on social care services for the frail and elderly, so these ideologically driven Tory cuts are the reason that millions of elderly and infirm people are being left with totally inadequate care, meaning they end up in hospitals, which puts a lot more strain on the NHS (which the Tories are also deliberately under-funding). 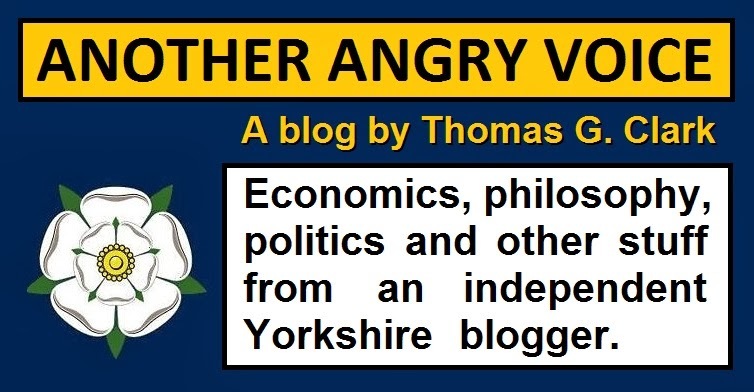 The infuriating thing is that despite the devastating impact of these ideologically driven Tory cuts going on all around us, our local councils have no choice but to raise Council Tax rates in a desperate attempt to plug a few of the most serious of the gaps. So where has all the money gone that the Tories have saved by slashing the Communities and Local Government budget to pieces? 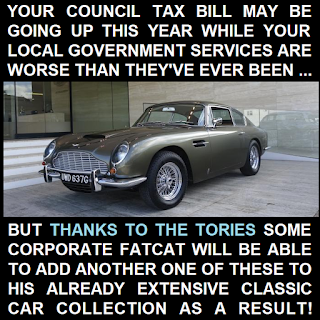 While they've been gutting local government budget the Tory government have simultaneously been distributing lavish tax cuts and handouts to corporations and the mega-rich. They've slashed the top rate of income tax to give an average £100,000 annual tax break to Britain's 13,000 income millionaires, and since 2010 they've cut the corporation tax rate from 28% to just 19% today, (which is by far the lowest in the G7). Then there's all the handouts the Tories have given to corporations and the rich through ridiculously one-sided outsourcing contracts that cost more to run than they'll ever actually save, rip-off privatisation scams to flog off public property at way below its true market value, and the wholesale give-away of public property to wealthy Tory donors. 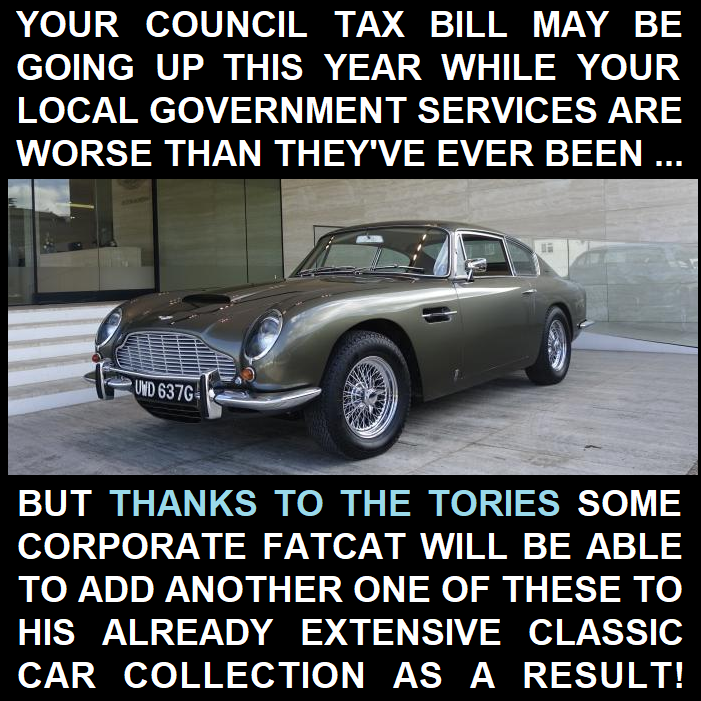 So the next time you ask yourself why you're paying way more Council Tax when your local services are worse than they've ever been before ... some smug corporate fat cat somewhere has purchased a brand new luxury yacht to berth in Monaco, or blasted six figures on a classic Aston Martin to add to his already extensive car collection. Thanks to the Tory ideological obsession with the upwards redistribution of wealth, that's what you're paying for.